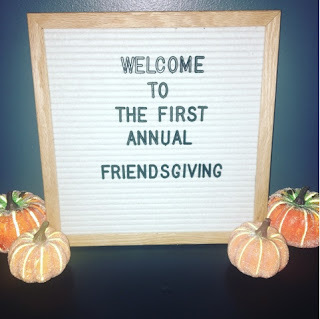 This past Saturday I hosted the first annual Friendsgiving. I invited a few girlfriends to come over and celebrate a traditional Thanksgiving meal. We made it pot lock style, but with a menu. Originally it was supposed to be around 17 of us, but ended up with 11. It was the perfect number for space in my house, and to all be in one conversation. We still would have made it work if we had a full house though. 4 kids, 3 girls all around the same ages. 1 little boy who got love from everyone. 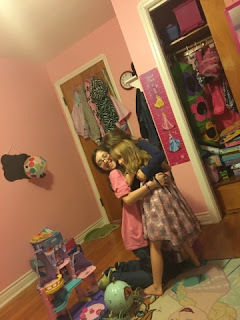 The girls spent most of the night in the bedroom playing and doing "school work". Here they are doing a family hug. For the most part they all got along, until it was past bedtime and crabby whiny butts came out. That was the big indicator party was over (10 pm). We are the 4 musketeers in our own little world. 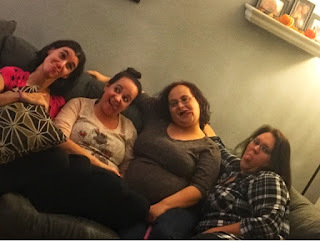 We started the party with 5, but the 5th left early to go watch the fight and we forgot to take a picture before she left. These girls are my other Fourths. 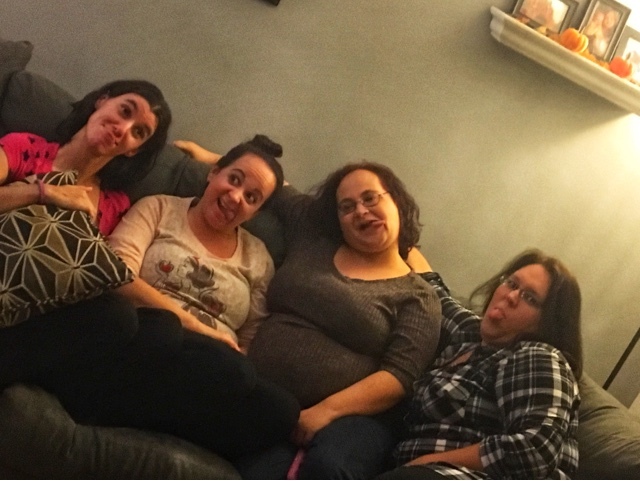 There is never a dull moment when we get together. After eating we played Heads-Up. There were lots of laughs going around. Lets talk food. It is the main reason we got together. I forgot to take a picture of our delicious spread (what was I thinking). It was kinda great that no one had their phones at the table though, no one was texting, or facebooking during the party. I made a turkey (for the first time ever) in a roaster oven that I borrowed from my parents. It was the most moist, flavorful turkey I think I have ever had. We also had homemade mash potatoes and gravy, canned corn, homemade broccoli casserole, homemade stuffing, and Hawaiian sweet rolls. There was also Stouffers Mac and Cheese for the kids. Now I can't forget the desserts. We have Pumpkin Pie, and Chocolate cream pie. I also made mini apple pie bites, and apple crescents from baked apples I had made in the crock pot. (Those recipes will be posted this week). We had so much leftovers, but everyone took home some, and I can go crazy with Turkey recipes. Today I am making Turkey Noodle Soup. Do you and your friends host your own Friendsgiving?